The quilt sandwich is made up of three layers - the quilt top, batting and backing. 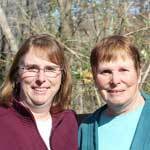 Click to watch the Learn to Quilt - How to Make Quilt Backing video in Youtube. The quilt backing should be cut larger than the quilt top. 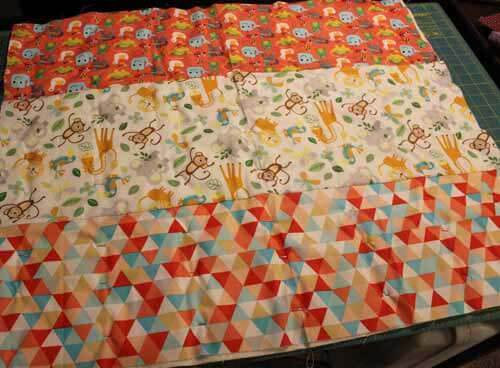 For a small miniature quilt or baby quilt, the backing should be 1-2" larger on all sides. Hence, for a miniature quilt or baby quilt, the backing should be at least 2-4" wider and taller than the quilt top. For a larger quilt, the backing should extend about 4" larger on all sides. Meaning, it should be at least 8" wider and taller than the quilt top. 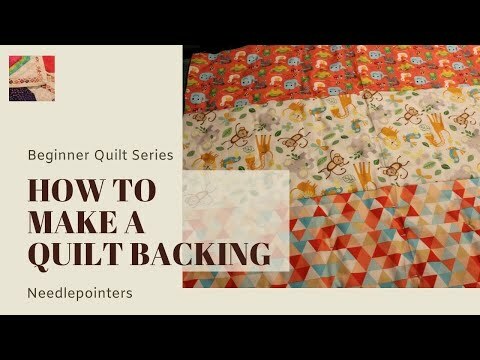 Why is the backing (and batting) made larger than the quilt top? Extra fabric is needed to allow for fabric taken up during the quilting process. After quilting, you will trim it down to the same size as the quilt top. Remove selvage edges from all backing fabric. The selvage is woven tighter and sometimes a different weight which can cause the fabric to pucker. For smaller quilts and baby quilts, you may be able to cut the backing from a single piece of regular 44" wide fabric. Just make sure it is at least 1-2" larger on all sides. For larger quilts, you may be able to purchase extra wide fabric made specifically for quilt backings which coordinates with your quilt. But make sure it is at least 4" larger on all sides. However, if you do not you have a single piece of fabric large enough for the quilt back, you can sew together pieces of fabric to make the required backing size. When piecing the backing, the seams can be vertical or horizontal. 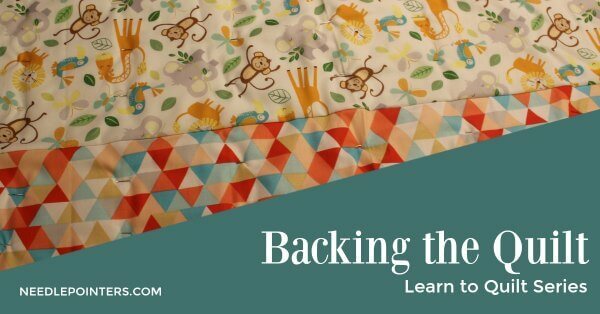 Join the backing fabric pieces together using a 1/2" seam allowance. Press the seams open or to one side (your chose).